Before Chowringhee was grown to a grand centre of amusement and entertainment for the European communities, Lall Bazar had been the best attraction for them. Calcutta’s first theatres, hotels and restaurants, coffee house, ball rooms, shops and markets were all clustered around Lal Dighi. From the junction with Mission Row, there is eastward down the length of the street. The grand house dominating the composition is the house of John Palmer, Palmer was one of the richest merchants of then Calcutta, the so-called Prince of Merchants, but in the end became a pauper because of his habit of charity. Palmer’s house was sold shortly afterwards to the government and converted into a police station, now the police head quarter. Beyond it, on the intersection with Chitpore Road, is the house that served as a court for the Justices of the Peace. Opposite Palmer’s house stand the emporium and auction rooms of Taylor and Company. This is a coloured aquatinted plate no. 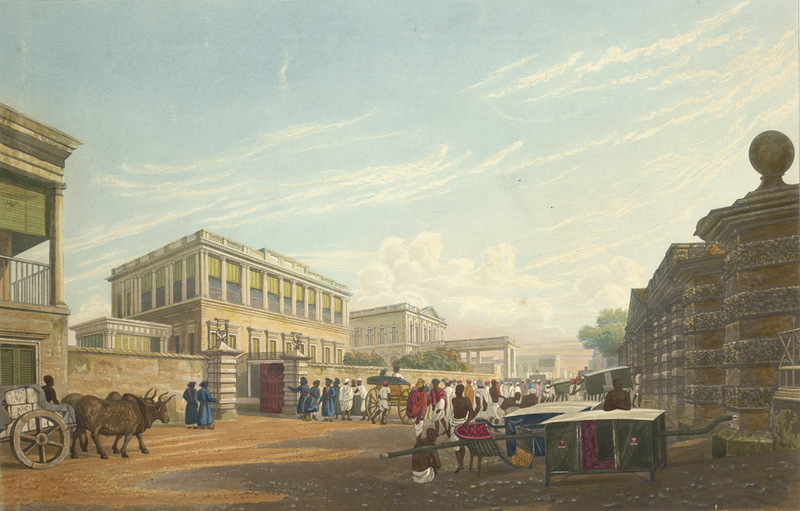 16 from James Baillie Fraser’s ‘Views of Calcutta and its Environs’, painted in 1826. This entry was posted in Commercial Houses, Industrial Houses, Shops/ Markets and tagged buildings, dalhousie square, James Baillie Fraser, johm palmer, lal bazar, lall bazar police station, lithograph, loll bazaar, old calcutta, palmer's house, prince of merchants. Delightful as always!! Thank you for sharing.